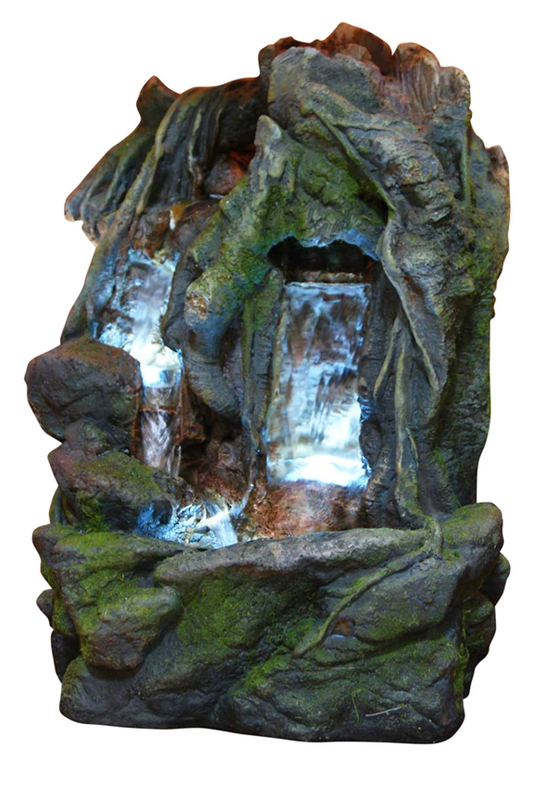 Lighted Water Feature With Rustic Appeal. Use Indoors Or Out. Venture into the mouth of a mysterious cave, deep within the rain forest. Large rocks are covered with creeping vines and other foliage, and the the combination perfectly frames the lighted cave. 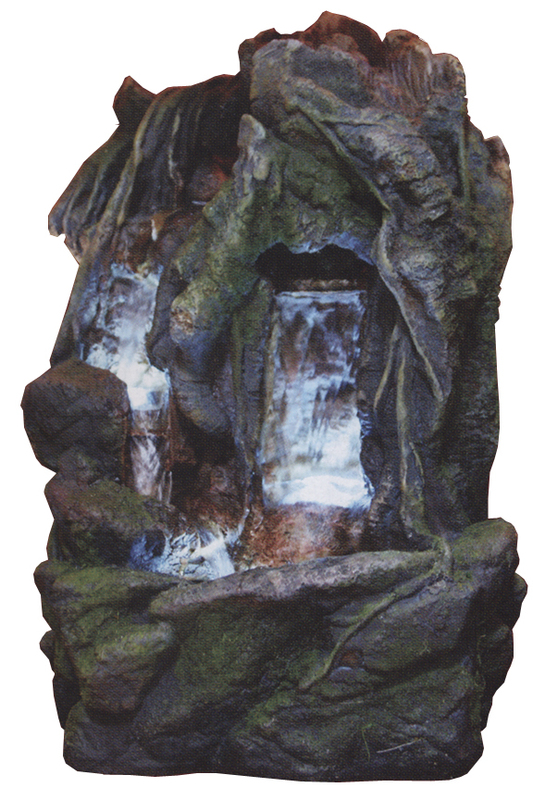 A gentle waterfall flows down one side of the fountain, and at the center, a deep cave is filled by a larger, more severe set of falls. Each area is illuminated with underwater lights, so the water shimmers as it flows, and the interior detail is put on full display. Water will pump up from the base to collect near the top of the unit. It will then begin to flow downward, and into the large pool at the bottom. Fast moving water rushes at the back of the main cave, while another stream gently trickles and flows over the rocks on its much slower journey. The fiberglass construction makes it look like real rocks, but in reality, it's much lighter and easier to work with. The durable material is still safe for outdoor use, but it will be much easier to take inside if you choose. Complete with all parts necessary to run it, and backed up by a one year warranty from the manufacturer. Easy Set-Up. There will be no guess work, and nothing additional to buy after it arrives. The pump and everything necessary is included for the fast and simple install process. Underwater Lighting. Submerged LED lights enhance the look of the moving water, and improve detail in the rock and wood. Natural Look. Easily mistake it for the real thing because it looks just like real wood and stone. Excellent detail work provides an authentic look, but the whole thing is made from fiberglass. Superior Quality. Better looking and longer lasting that the competition, this model will enhance any space. The powerful pump will operate without failing, and the durable finish will remain vibrant for a long time. Inside or Out. Place on your porch or patio to blend with your landscaping, or use in your living room to bring the outdoors in. The incredible look of this product is sure to please no matter where it's used. This model is 13 inches tall, and 9 inches wide on it's longest side. 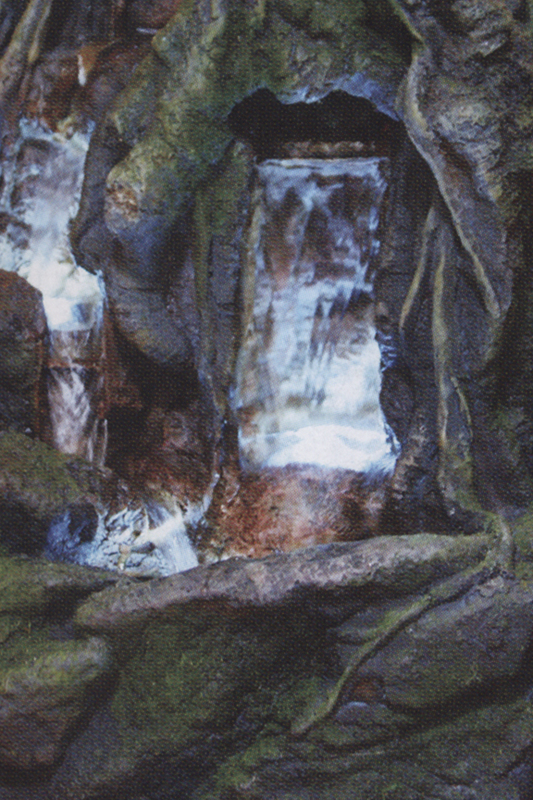 Deep within the woods, a bright cave emerges to reveal a secret location, and two gentle waterfalls. Fiberglass construction gives you a natural look, but it's lighter and more durable than the real thing. Order Yours Today! Can the lights be replaced when they burn out ?